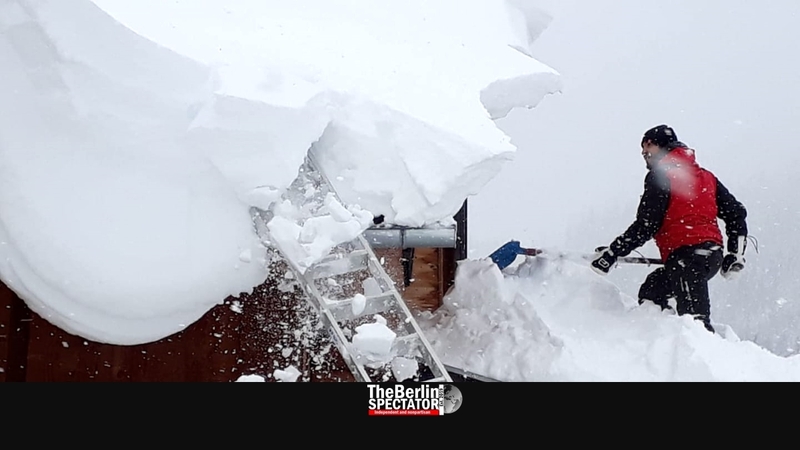 Because of the excessive snow fall in many parts of Austria, the authorities in charge intend to blow up large snow slabs in the Alps, using explosives. That way they want to cause avalanches to go off in a controlled way. Experts believe this might happen on Friday, when the ongoing snowfall will cease at least for a few hours, according to forecasters. Today the central Austrian municipality Hochkar became an official disaster zone. Here and in other regions, roads were closed. The famous Hochkar Alpine Road had been cleared on Tuesday. Today, it needed to be closed again today due to all the snow and because trees which could not withstand the weight of the snow fell and blocked the road. Other areas in Austria were declared disaster zones too, including Styria, where the highest avalanche warning, level 5, is in place. The country’s army is expected in the Hochkar region. Soldiers are supposed to clear buildings from the snow and help residents who are marooned. In Upper Austria the situation was not better. In and around the city of Linz, the fire brigade was in charge of removing snow from roofs, in order to make sure they do not get crushed. The radio and TV network ORF reported, schools in the Austrian diaster zones had sent students and teachers home because their way to school and back home was simply too dangerous. Also they were afraid everyone might be cut off from the rest of the world at schools all over the affected regions. Austrian authorities keep on telling people to refrain from skiing, warning them of the dangers, which have already cost several lives in the past days. Tourists who stayed in huts on skiing slopes had to be rescued and sent home. In some parts of central Austria, 2 to 3 meters of snow (79 to 118 inches) were measured. Across the border, in Bavaria, the situation was difficult as well. Here too, residents and tourists were cut off in alpine villages. Roads were blocked by snow and fallen trees. In some cases, the local authorities had food sent to inhabitants. The goods were transported in trucks with snow chains. Because more snow was forecast, those affected are not expecting an improvement of the situation anytime soon. In Miesbach county and the municipalities Pusterwald, Pölstal and Hohentauern, disaster alerts are in place. Like in Austria, the highest avalanche alerts were valid in some regions, where traffic on roads and train tracks basically collapsed. The Autobahn A27 was affected too. In northern Germany, on the other hand, there was no snow. Instead a storm surge was reported, which affects the Baltic Sea coast. In Hamburg, authorities warned ships of approaching storms and floods. Parts of Lübeck’s Old Town are already flooded.